In 2017, Amber Baldwin realized she was in a rut. She worked long hours from her home near Seattle, and on weekends, there was always some sort of project or chore to do at the house. She felt like she never left, that she was working too much, that she wasn’t living. She felt lucky to have a job she could do anywhere, so figured, why wait? 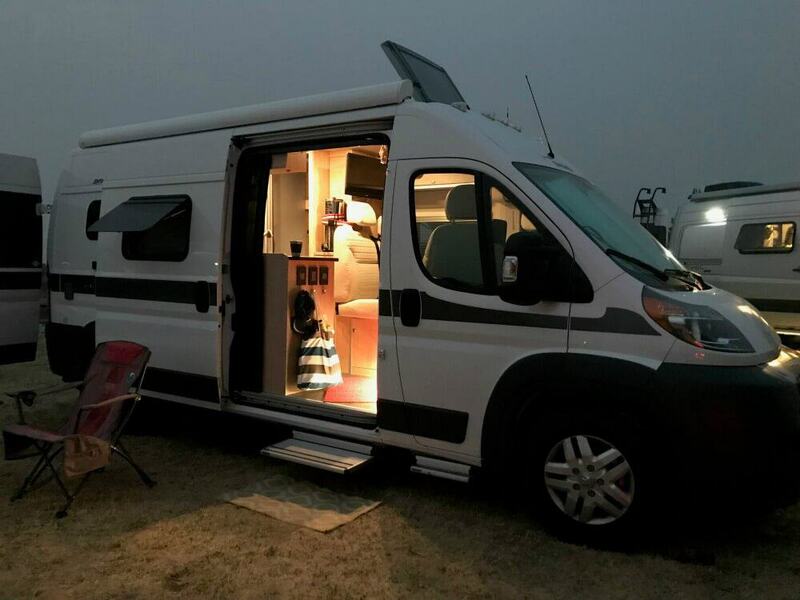 So, Amber got rid of all her stuff, sold her house, and bought a 26′ Winnebago RV. 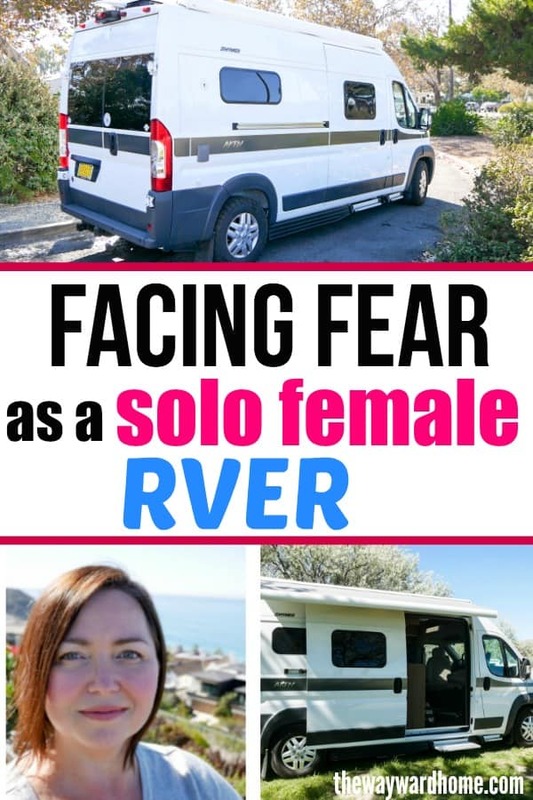 While she was sorting through her belongings and preparing for life in her new motorhome, Amber started to feel claustrophobic. 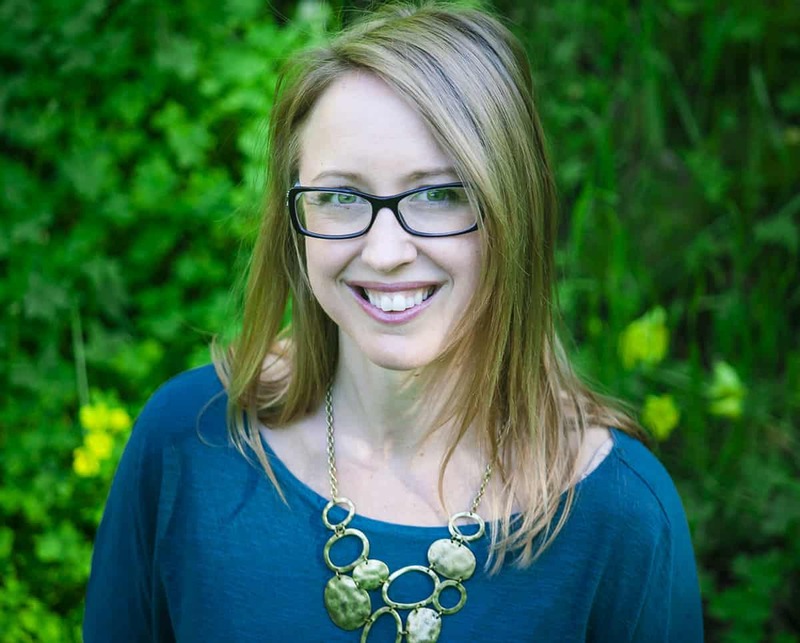 While she felt elated by her choice to travel full-time and newfound freedom, Amber, who started a website called Story Chasing, also felt fear and anxiety. She knew nothing about RVs or RV maintenance, and questions swirled around in her head. 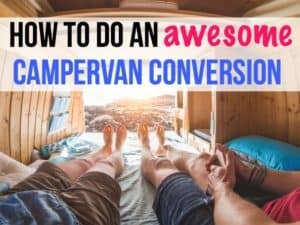 What if I hate RVing? Am I going to be lonely? 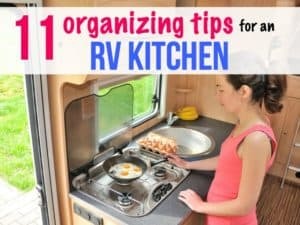 What equipment do you need in an RV? How do you dump sewer tanks, and what’s a black tank versus a gray tank and should I get a composting toilet? But she researched, and learned the answers to these questions, slowly building her confidence. She said her first time at Lake Tahoe was terrifying; she was in a huge RV navigating a tiny, narrow road and wanted to turn around. But she kept on going, and was so happy to have overcome her fear. When Amber first started RVing, she was concerned about where she’d sleep. She knew she’d have to move around often, and came up with ways to feel safe. Amber also keeps mace with her, and has specific rules about stealth camping. For those who aren’t in the know, stealth camping is parking and sleeping where nobody knows you’re inside, often on a street or in a neighborhood. When boondocking, Amber makes sure she arrives during daylight hours, so that she has plenty of time to move somewhere else if need be. She always has a backup location at the ready that she finds through the use of camping apps. Partway through her RVing adventure, Amber decided to switch rigs. 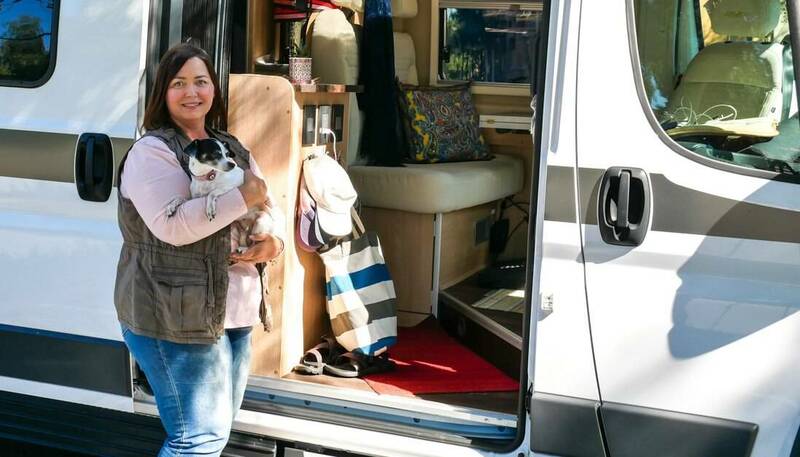 She was used to living with less, and the 26′ motorhome seemed too big. Plus, it was hard to navigate on city streets and narrow roads. 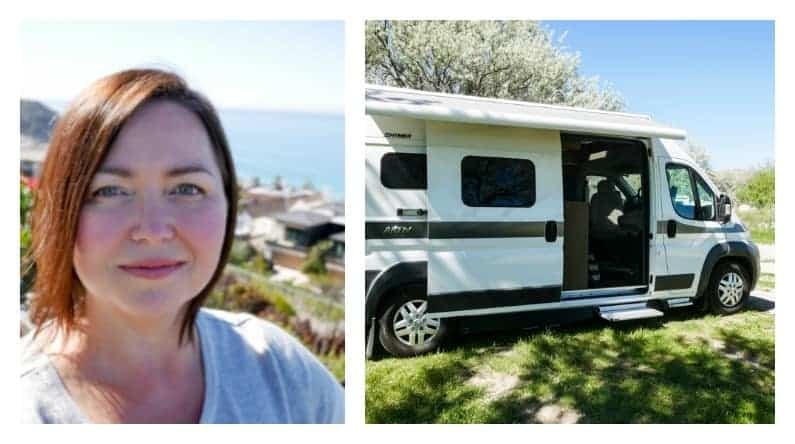 So, she downsized once again, this time to a Hymer camper van. Hymer is a popular van in Europe by a German manufacturer built on a Dodge Ram Promaster chassis. 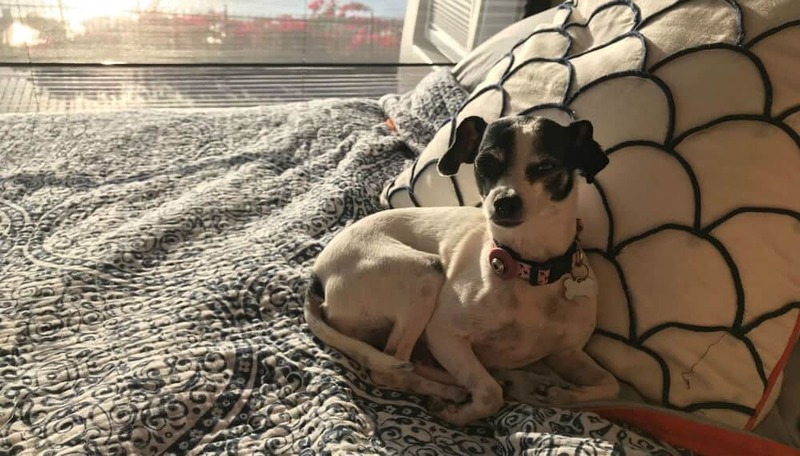 Amber isn’t traveling the United States on her own – she also has a small dog named Lily. 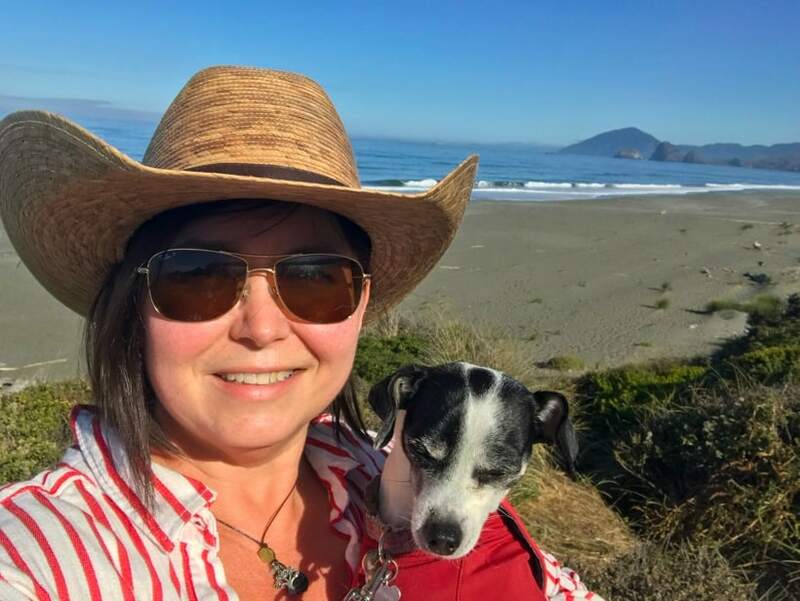 A lot of people want to travel with their dogs, so I asked Amber how she keeps her dog safe and cool on the road. She also installed a Canary camera so she can keep watch on her pup when she’s out and about. Also, there’s a temperature gage in her van that Amber can monitor from afar. 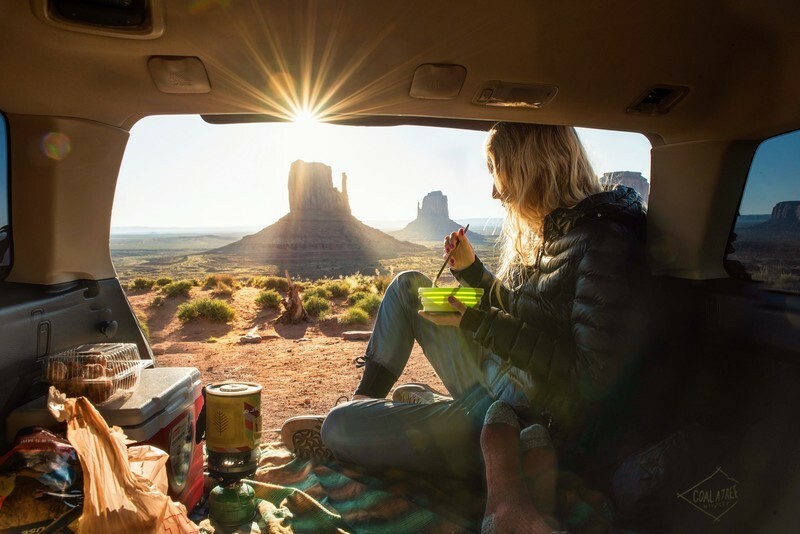 “I also make sure I’m never too far away from the van, and I try to stay in cooler climates,” she said. Amber is lucky to have stayed with her same company while also traveling the United States in her van. Just recently, she decided to become a consultant rather than an employee to reduce her hours and stress. 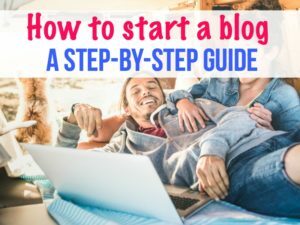 Amber now works on blogging and monetizing her YouTube channel as ways to earn extra income. She recently decided to start releasing income reports to motivate and inspire other people who want to make money while traveling full-time. She said there are so many options out there for making money. 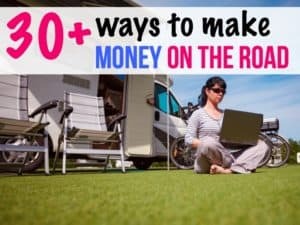 To see some options, check out 30+ ways to make money from anywhere. Amber is a huge fan of chasing dreams, and that’s where the name Story Chaser comes from. Amber thinks a lot about the idea of retirement, and how many people don’t reach the golden years. One of those is Shawn O’Conner of Road Warriors, a fulltime RVer who always talked about living your best life today and not waiting for tomorrow. Tragically, he died in a scooter accident in 2017 and was only in his mid-30s. This drove the idea home even further for Amber, who’s happy she made the choice to live a life on the road less traveled. She hopes her story inspires other women to get up and go, to live the life they’ve been waiting for, to not be overcome with fear. I think after my one year lease is up, I may take on the challenge of living in a camper van. At least a year or so. May save a lot of money that way. You are indeed an inspiration. Stay safe out there. Funny how everyone is just starting to do this now. I started full timing alone as a single woman when i was 29. Everyone told me i should write a how to guide, but i never got around to it. Back then there were so few of us under retirement age living full time that we wanted to keep it stealth. I’m still full timing at 51… still just me and my dogs….5 of them.